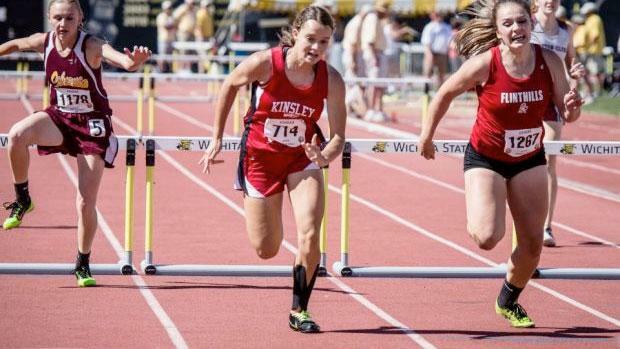 Last Fall's classification changes in Kansas will be felt when the 2017 track and field season gets rolling for the state's Class 1A teams. Olpe and South Gray, both 2A schools a year ago, are now 1A members - and seem to be the power-brokers in the Class 1A boys division in 2017. Olpe was the Class 2A boys state champions last year, scoring 65 points, most of which came from four-time gold medalist Kyler True (pictured at left). He won the 800, 1600 and 3200, and anchored the Eagles' winning 4 X 800 relay in a state record 8:01.18. True, a nationally-ranked 800 and 1600 meter runner who is headed to Oklahoma State University next Fall, is back for his senior year and the smart money says that he'll put some big numbers in the team's scoring column again come May. 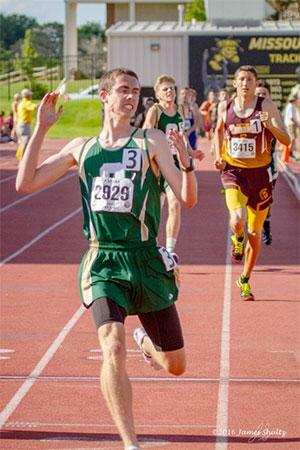 In addition to the 800, 1600 and 3200, he enters the 2017 season with Class 1A's top returning time in the 400 meters (50.55) - though he has not run that event in past year's state meets. Olpe also has senior Matt Burkert in the 800 (second best time entering the season), senior long jumper Dylan Redeker and senior pole vaulter Kason Ziegler who can contend for state titles. South Gray counters with a bit more balance on its squad, including senior pole vaulter Derrek Berg, junior discus/shot putter Gilbert Peters, junior sprinter Craig Griebel and senior distance runner Luke Skinner. Defending champion Ashland was hit heavy by graduation, but they do return senior distance ace Quanah Gardiner, a University of Kansas commit who won the Class 1A 800, 1600 and 3200 a year ago - setting up a juicy matchup between he and True at this year's state meet. Teams with an outside shot at the state team title this year, but may need to develop depth over the course of the season, include Stockton, Pike Valley, and St. John Beloit. Stockton senior Kian Coffey, the defending state champ in the triple jump, is also the top returner in the long jump this year, and teammates Kylar Williams, a junior, and Brayden Winters, a senior, also should score well in the horizontal jumps. St. Johns-Beloit, runner-up in Class 1A last year, is led by senior Davis Dubbert, who won the high jump in 2016 and is also the top returner in the javelin this year. Other returning state champions in Class 1A boys this year include senior Brady Ricke of Attica (pole vault), senior Trent Poe of Norwich (shot put), and senior Landon Ledford of Hartford (discus). Centralia's girls enter the 2017 season as a strong bet to defend its team championship from a year ago, which was the first-ever girls track and field championship for the school. The Panthers are still deep on the track and in the field events, including pole vaulter Breanna Schmitz, who won the state title as a freshman last year. Sophomore teammate Madison Lueger is a strong title contender in the javelin (she was third at state as a freshman), and Centralia also should score well in the distance races with sophomore Tamra Jones and senior Sadie Jones. The teams who seem to have the best shot at taking the team title away include Dighton, Lakeside, and Axtell. Dighton junior Jordan Speer leads her teams' charge. In addition to being the defending state champ in the javelin and shot put, she has the second-best mark in the discus among returners from last year. AT RIGHT: Rylee Gleason of Kinsley won the state title in the 300 meter hurdles as a freshman. She is one of 12 defending 1A girls champs expected back this spring. Those three throwing events are also where Lakeside is strong, with junior Baylee Brummet leading the way. Lakeside junior Rachel Miller is a state title contender in the 100 and 200 meter dashes. Axtell makes the list of preseason contenders because the team typically performs well in the relays. They won two of three relays last year, and junior Mariah Deters returns to defend her state title in the high jump. In fact, there will be a lot of familiar faces defending state titles this year in the Class 1A girls division. The defending champions return in 12 of the 15 non-relay events, and those 12 returners come from 11 different schools. Dighton's Speer is the only two-time winner returning, having won the shot put and javelin in 2016.